I have seen several times in my answers, when the author of the question asks a simple trivial question in the comments of the accepted answer as Your suggestions solved the problem X, but how do I solve Y now? I usually tend to ask them to start a new post if the question involves an altogether detailed answer, but for simple quick fixes, I usually reply it over the comments and then they just thank over the suggestions. Is it acceptable to flag these comments which are not related to the original question, e.g. no mention of this new requirement in the original post as 'no longer needed'? I just had a few comments declined today for one of my posts. Would like to know more clarity on this. I declined the flags you raised on this. I'm happy to explain my rationale, but don't take this as creating or implying any sort of general rule. In the motivating case, the user asked you a follow-up question, you asked him to clarify, he did, and then you replied with a quick answer. That you were able to reply with a quick answer basically served as confirmation that it was a "simple" follow-up question, and thus a legitimate use of comments. The user then asked yet another follow-up question, conceding that that one may have been off-topic. You responded to that by linking him to a Q&A on another site. You raised a "no longer needed" flag on Delfin's last comment. 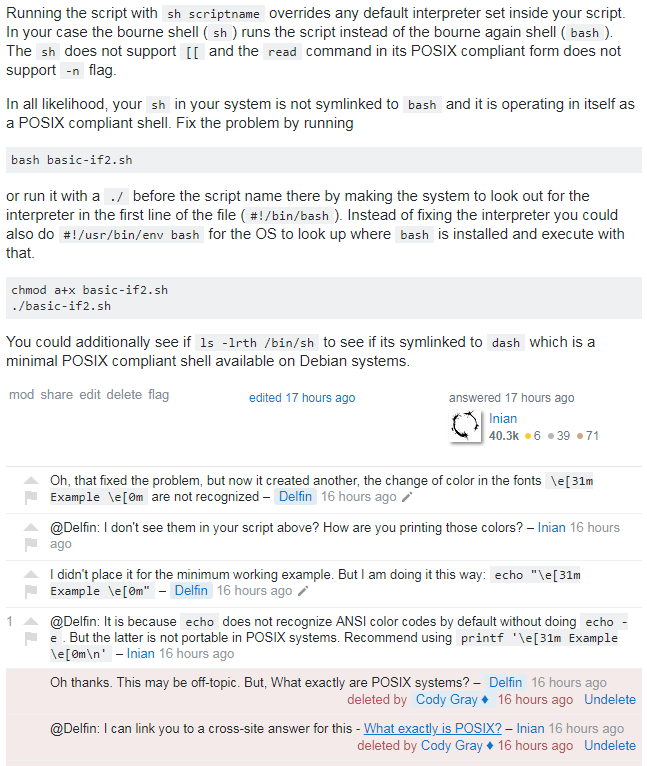 I deleted this comment because, in my judgment, the question being asked there was utterly off-topic and (more importantly) unlikely to be helpful to others ("what is POSIX?" is either blindingly obvious and/or downright trivial to Google for). This deletion marked your flag as "helpful". I declined "no longer needed" flags that you raised on Delfin's other two comments, because, as explained above, I determined that these were simple follow-up questions and thus legitimate uses of comments. I kept them because they were short enough that the noise volume wasn't a concern, and because I thought they might be of help to future readers. If one person has a follow-up question, it's very likely that others will have the same follow-up question. This is kinda the whole principle of Stack Overflow: one question, one answer, many beneficiaries. …in general, if you use the flag then be sure to do so before you answer the comment. If you do it afterwards then it looks too much like the comment was relevant and should be kept. Not only did your response make it look like the comment was relevant, but the fact that you provided a response which was appreciated by the asker made it look like deleting this content would be making the Internet a worse place. Given my moderation strategy, that was a natural reason to dismiss the flag and leave the comment in place. Honestly, I don't really understand what motivates people to flag these types of comments, especially with such determination that they will flag them multiple times when they don't get removed. How are these comments hurting anything? Why are you so motivated to get them removed? Maybe I'm missing something and you can explain this to me. What should be done about questions where the answer is directly found in the API? If broken code in a question is later fixed, change the title to solved or delete? Should I change the accepted answer if a new answer answers the question better? Struggling to get an irrelevant and incoherent comment deleted; why decline this flag? Is the concept of “accepted answer” no longer needed? Why were four of my comment flags declined?